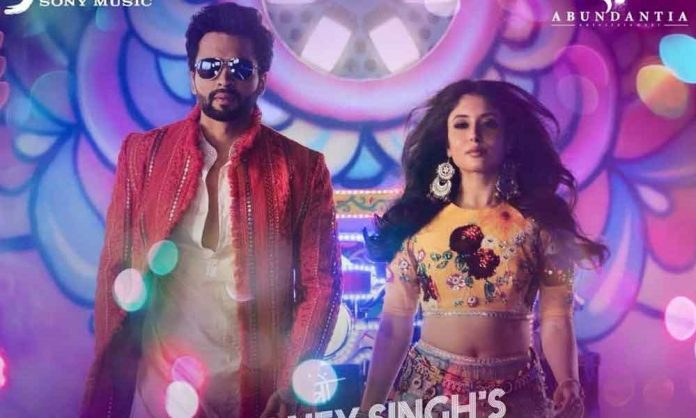 Yo Yo Honey Singh’s party anthem from the upcoming movie Mitron “This Party is over now” has been receiving appreciation from all quarters, not only the audience but Jackky Bhagnani who is also featuring in the song could not stop appreciating the music sensation. The actor showered Yo Yo Honey Singh with praises saying ” Honey Singh can pick one genre and make everyone like it.” He added saying “Honey Singh is a trendsetter”. The music composer has earlier won hearts of the audience with his varied compositions hailing from different regions across the nation. Previously, he has composed songs like Lungi Dance in Tamil, Aata Majhi Satakli in Marathi, Achko Machko from Gujrat having a flavor of a specific region and yet making everyone groove over it. After Dil Chori and Chote Chote Peg broke major records this year. Yo Yo Honey Singh has now treated us with another party anthem with a touch of Gujrat, that has become an instant favorite. The one of its kind anti-alcoholic party anthem “This party is over now” has been gaining popularity owing to its quirky lyrics and foot tapping beats, doubled with the traditional Gujarati flavor. The song has already recorded more than 20 million views and is the new party anthem in the clubs.